Back in the 1970's there was a show on the air called "Kung Fu" and it was a cult favorite because how would the student ever prove himself to the "master"? The answer was when the "student" could grab the pebble away from the "master's" hand. So what does this have to do with anything prospect hockey you ask? All season long people (including myself) have been singing the praises of Ryan Pulock (NYI 2013 1st) as the offensive leader of the New York Islander blueline. Thursday night Pulock was taken to school by the prospect who just might be the future leader of the Islander team let alone the blueline in Griffin Reinhart (NYI 2012 1st). 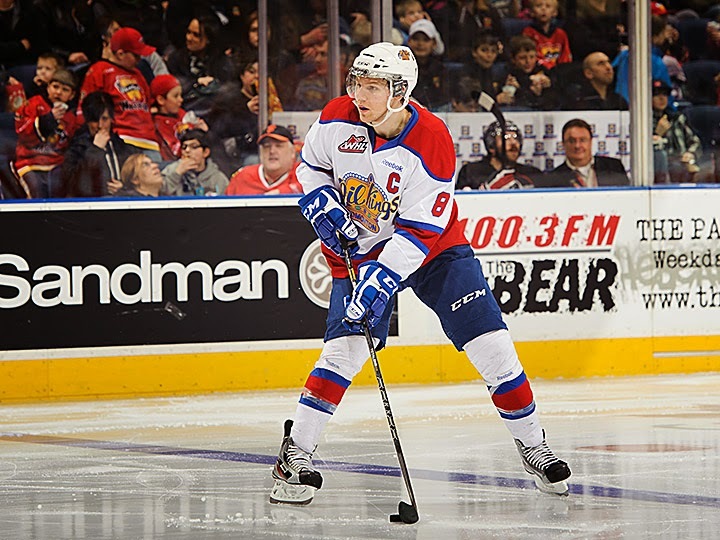 It was game 1 of the WHL's Eastern Conference semifinals between Pulock's Brandon Wheat Kings and Reinhart's Edmonton Oil Kings. Reinhart and his Oil Kings sent a loud and clear message to perhaps more than just the Wheat Kings after a textbook 5-0 whipping of the the Wheat Kings in game 1. Reinhart and friends just spanked the Wheat Kings at both ends of the ice from the 5 goal outburst to holding the Wheat Kings a total of 15 shots for the entire game. 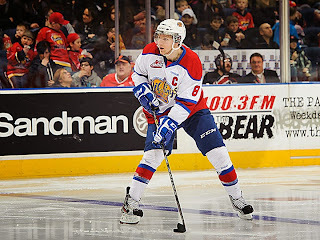 Reinhart the Oil King's captain earned the game's second star with a 2 assist, +1 effort as well as the defensive shutdown of the potent Wheat King offense. Reinhart and friends held the Wheat Kings to just 3 shots in the 1st period, 8 in the second and just 4 in the 3rd period. In the meantime the Oil Kings were playing a balanced disciplined game where they gave up 2 power plays in the first period and none after that. Reinhart had a secondary assist on the only goal that Edmonton would only need Edmonton's 1st goal of the game coming at 1:50 of the first period. Reinhart would add a primary assist on Edmonton's 3rd goal which was a power play goal at 12:22 of the 2nd period. For Reinhart it was his 3rd and 4th assists of the playoffs as Reinhart is 1-4-5 in 5 playoff games this season. Reinhart is supposed to be the defensive stopper but he does have an offensive game that he brings out in the bigger games. With Edmonton looking for a 2nd trip in 3 years to the Memorial Cup, nights like these will go a long way in helping Edmonton reach that goal. As for Ryan Pulock, he was turned into a non-factor by Reinhart and his Oil King teammates as they smothered every chance the Wheat Kings attempted. Game 2 will be Saturday afternoon at noon central time in Edmonton. In the QMJHL Loic Leduc (NYI 2012 4th) was scoreless on no shots but with 2 hits as his Rimouski Oceanic earned a game 1 win over the Blainville-Boisbriand Armada 4-2. Despite no offense, Leduc was named the game's 2nd star as the Oceanic built up a 3-0 lead over the first 2 periods and then held the Armada off in the 3rd period. Leduc had 2 minors for roughing and a 10 minute misconduct for an almost fight in the game's last minute. There wasn't much of a New York Ranger report but you can find what there was right here as we begin our transition over to the Blueshirt Bulletin.